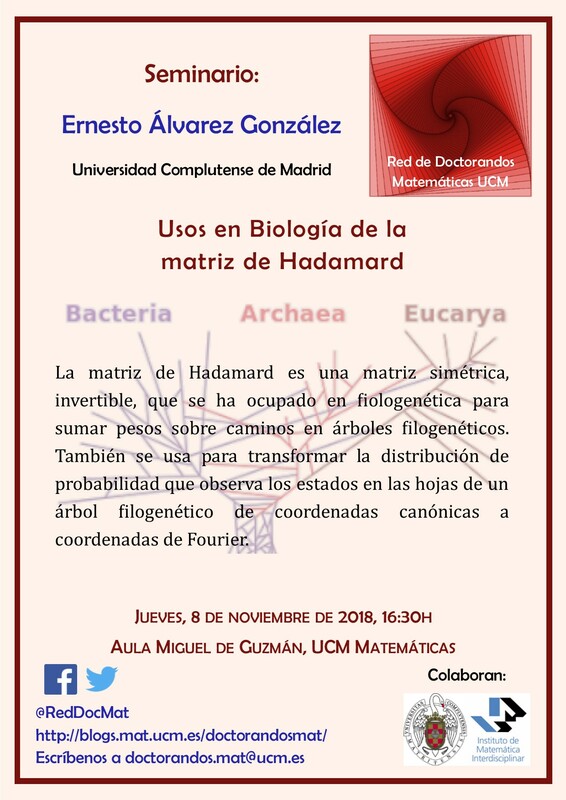 Organizan: Instituto de Matemática Interdisciplinar (IMI), Departamento de Análisis Matemático y Matemática Interdisciplinar y Grupo MOMAT. 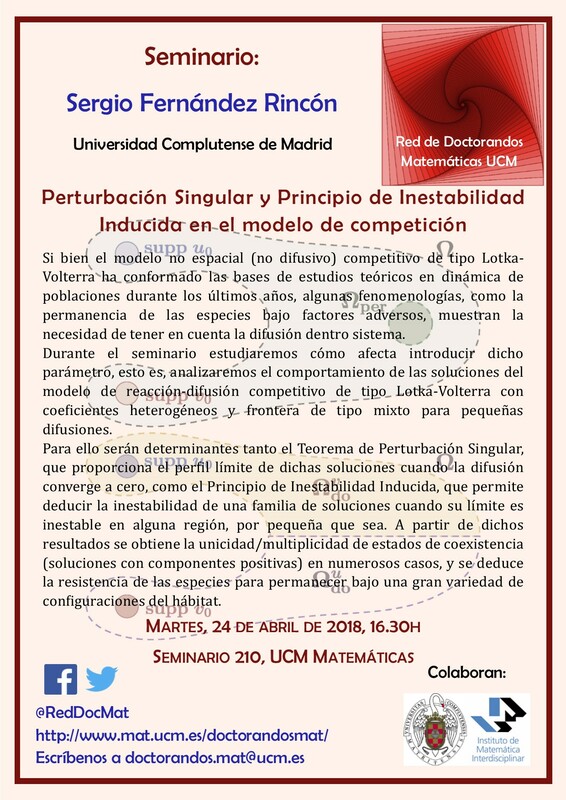 ¿La solución del sistema contributivo de pensiones en España es la sostenibilidad actuarial? Ponente: Mercedes Ayuso (Universidad de Barcelona). Ponente: Alexandre N. Carvalho (ICMC-Universidad de Sao Paulo). 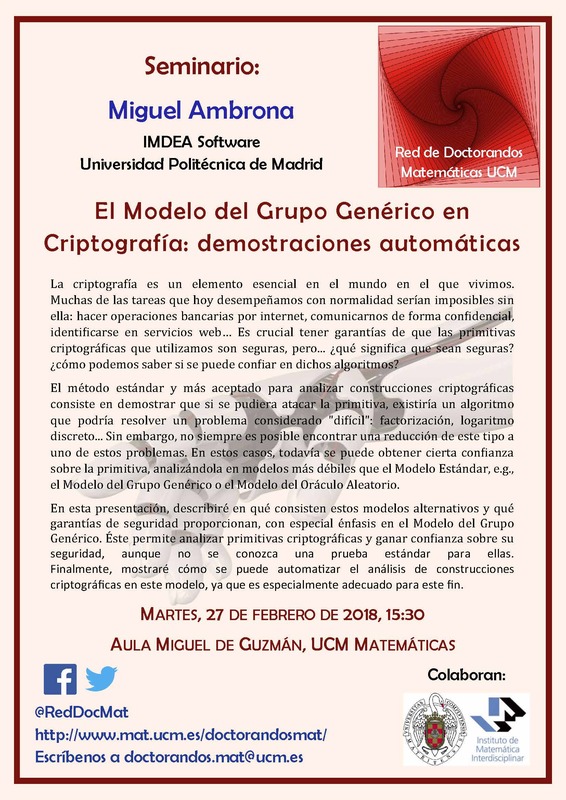 Organizers: Department of Mathematical Analysis and Applied Mathematics and IMI. 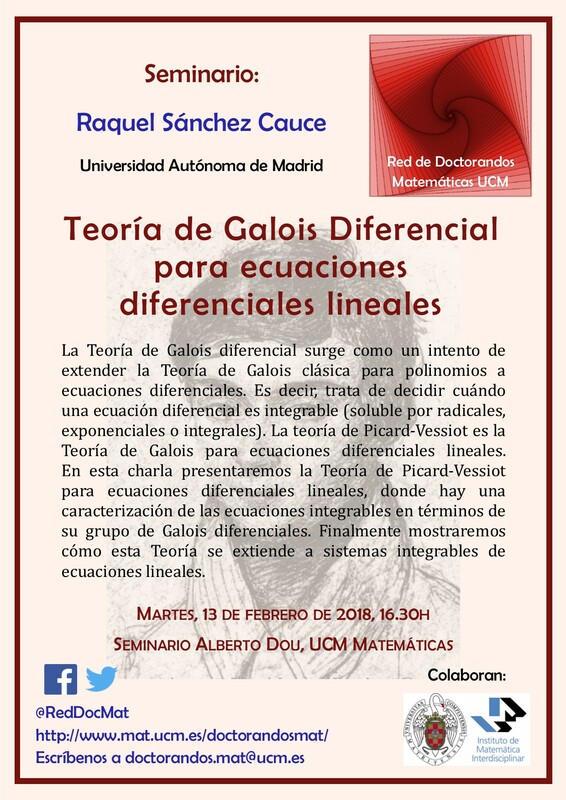 Organizers: Interdisciplinary Mathematics Institute and Network of doctoral students. Organizers: Research Group MOMAT, with the collaboration of the Department of Mathematical Analysis and Applied Mathematics and IMI. 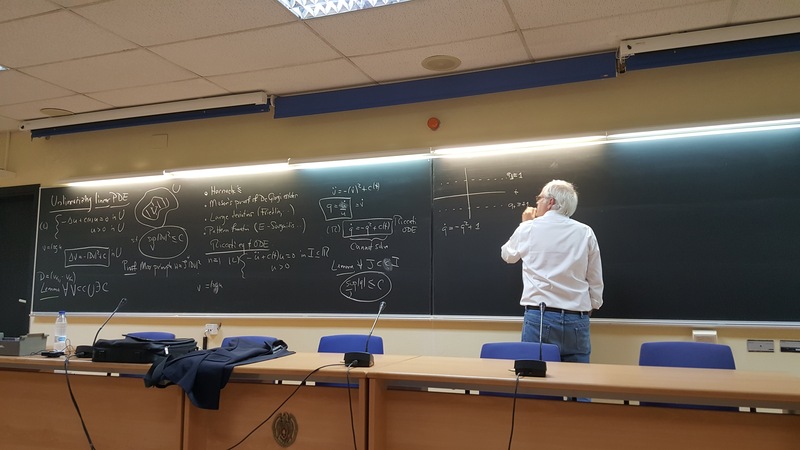 Integrability of dynamical systems: overview of main techniques with emphasis on the Darboux Theory of Integrability. 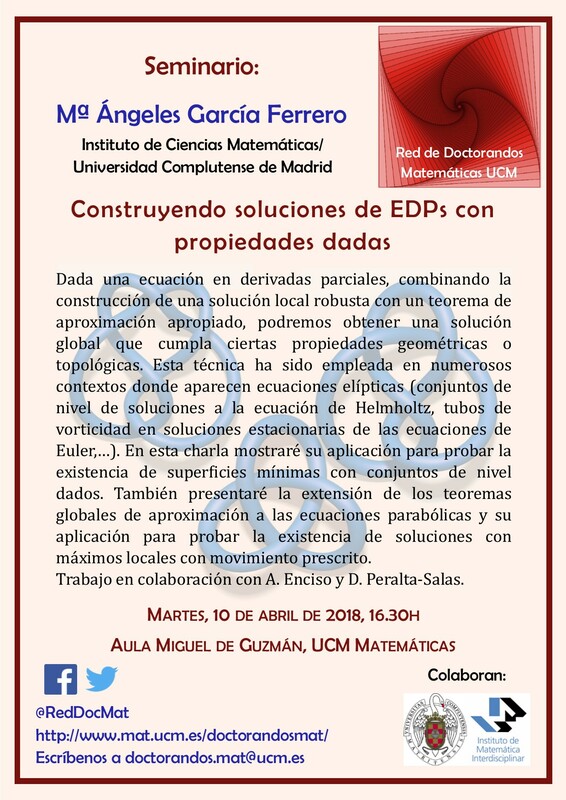 Prelectura de Tesis Doctoral: Global approximation theorems for PDEs and applications. 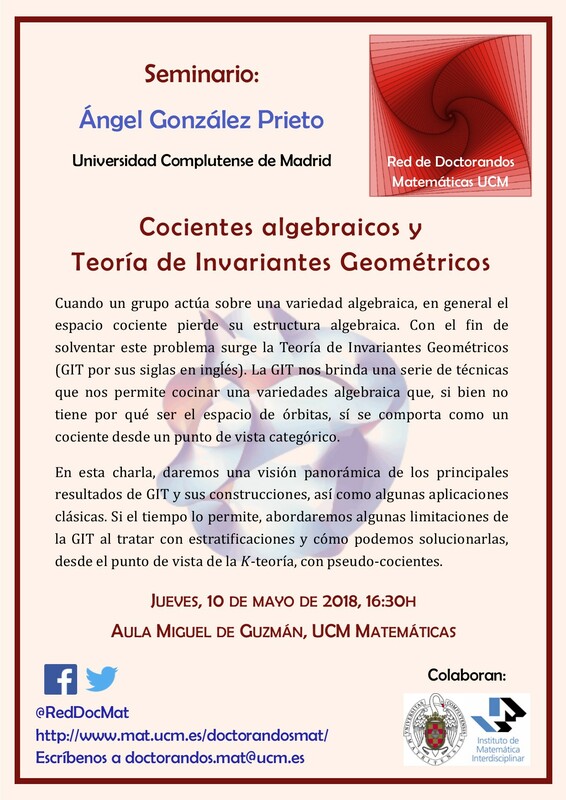 Organizers: Department of Mathematical Analysis and Apllied Mathematics and IMI. Ponente: Ángel Marín Gracia (Profesor honorífico del IMI). 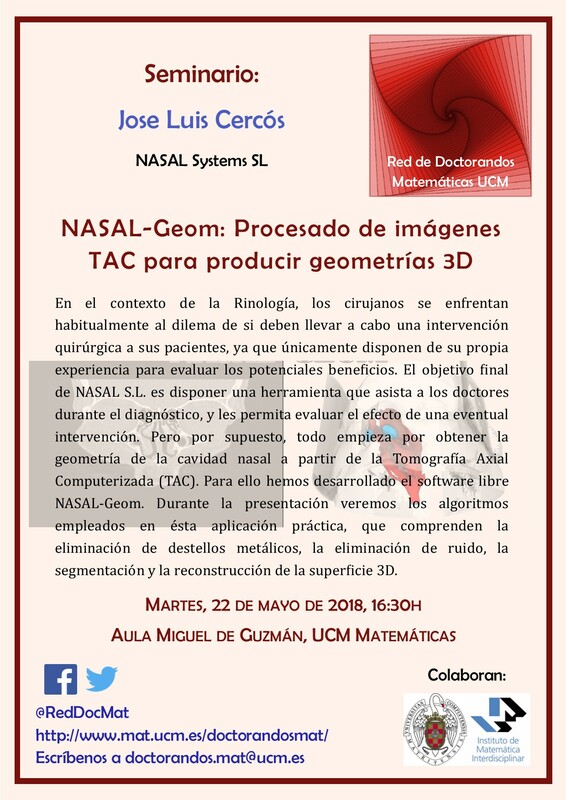 Fecha: 7 de marzo de 2018, 17:30h. 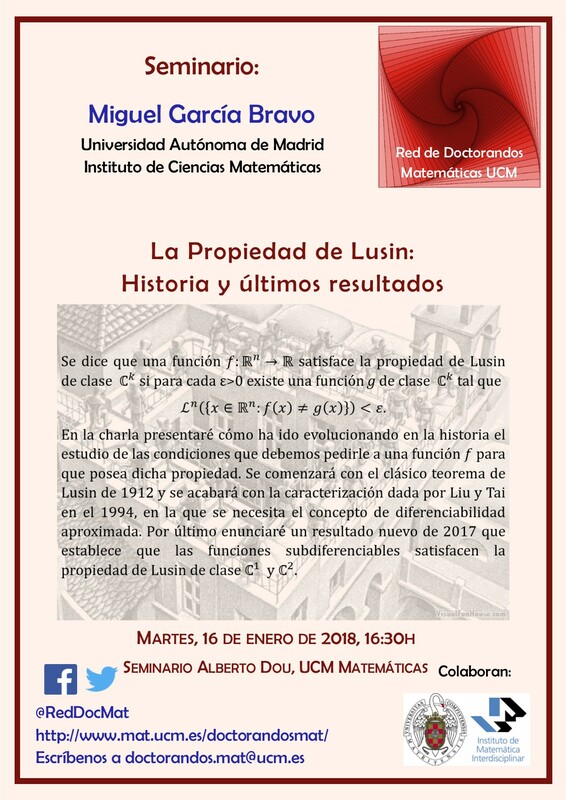 Organizan: Instituto de Matemática Interdisciplinar (IMI y Programa de Doctorando IMEIO. 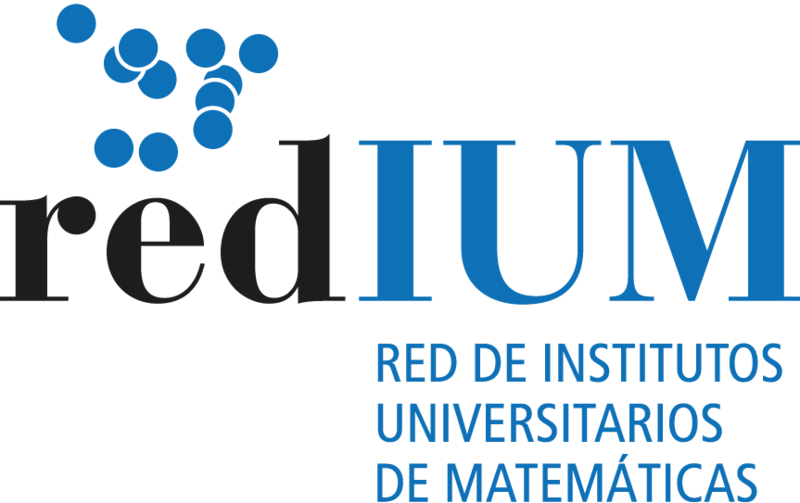 Organizers: Deparment of Mathematical Analysis and Applied Mathematics and IMI. 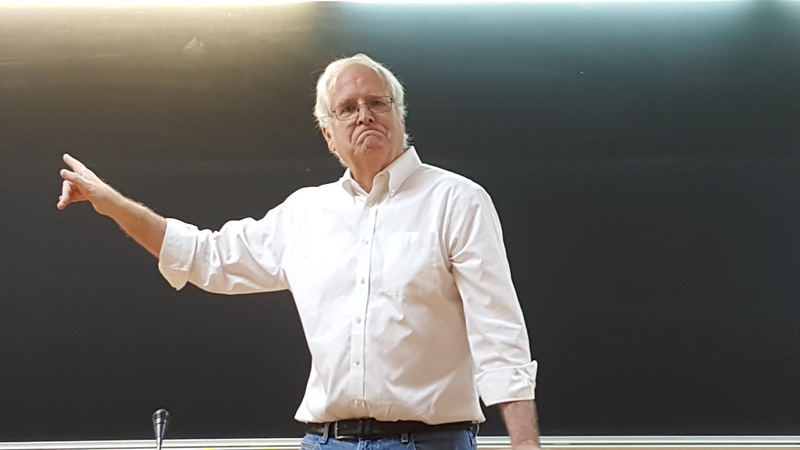 Speaker: Ignacio González García (Universidad Politécnica de Madrid). 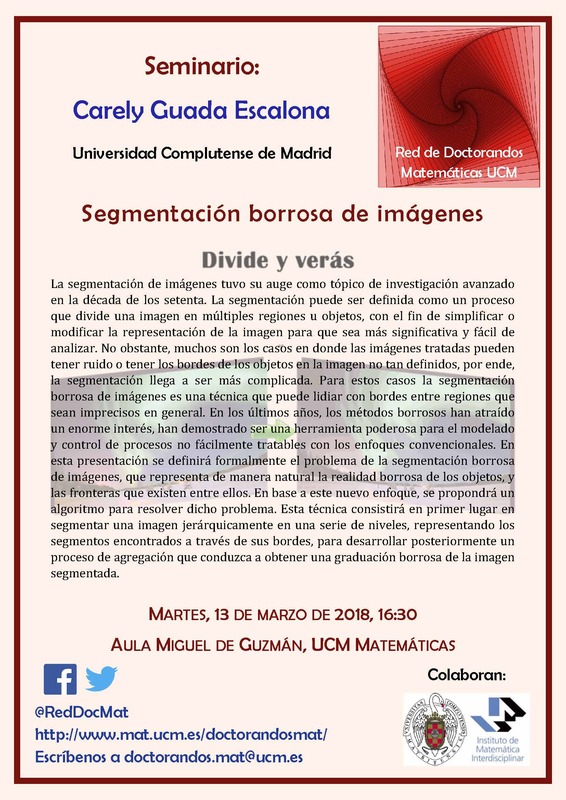 Date: January 30th, 2018, 16:30h. 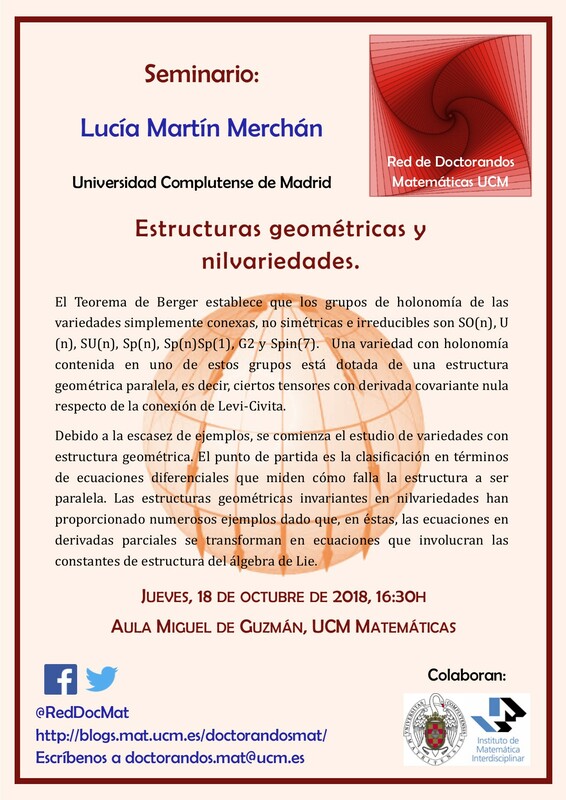 El problema 16 de Hilbert: ¿por fin la solución? Date: January 30th, 2018, 12h. Place: Room 209, School of Mathematics, UCM. Date: January 11th, 2018, 13h. 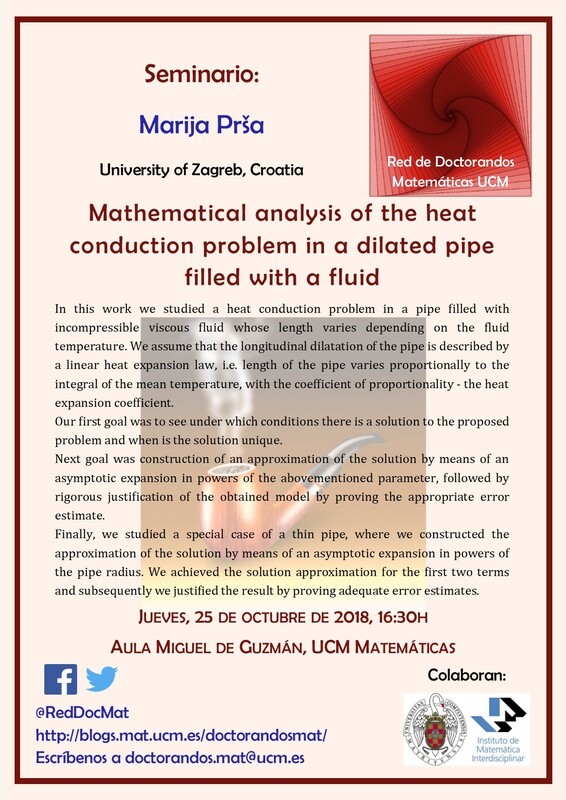 Place: Room 222, School of Mathematics, UCM.